Senator Bill Coleman substitutes on the show for President Pro Tem Greg Treat. 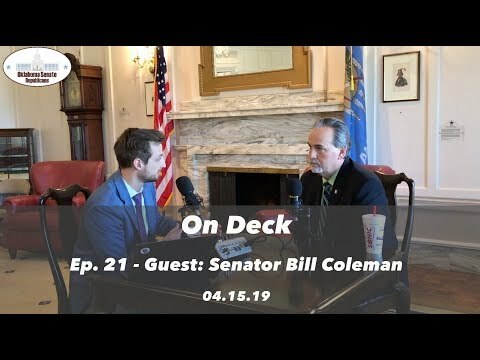 This week we get to know Senator Coleman more and also talk about the #CriminalJusticeReform measures he is fighting for this year in the Senate! Joining President Pro Tem Greg Treat this week on the latest episode of On Deck is Senator Jason Smalley! Senator Smalley helps us to understand the Pensions topic and explains all the different variables that must be considered before any actions can be taken. 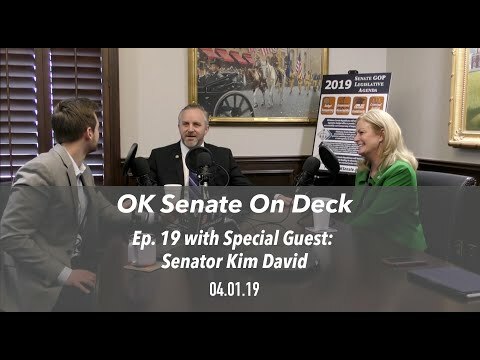 Senator Kim David joins President Pro Tem Greg Treat this week on the latest episode of #OnDeck to discuss the latest updates on #ConstitutionalCarry and several other topics! 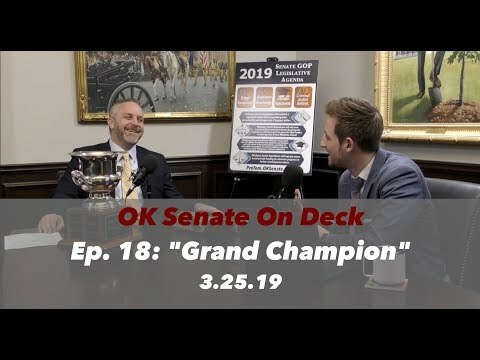 In this week's On Deck episode, we discuss Pension Reform, Government Accountability, Budget Updates, and Pro Tem Greg Treat shows off his Grand Champion Trophy he won at the Oklahoma Youth Expo! 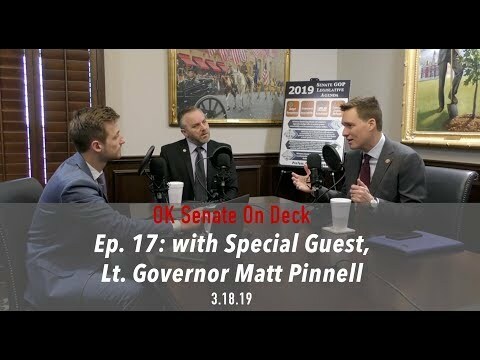 Joining President Pro Tem Greg Treat this week on our latest episode of #OKSenateOnDeck is Lieutenant Governor Matt Pinnell! Huge changes are being made on the leadership structure of our state agencies! 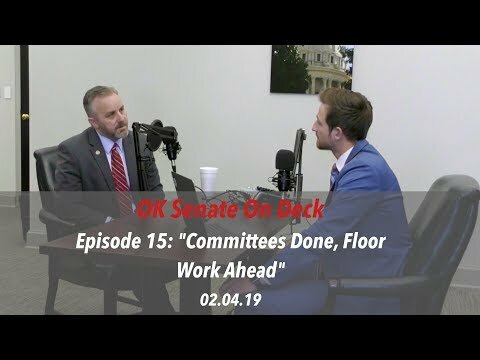 Check out this week’s On Deck episode with Pro Tem Greg Treat to hear his thoughts on why this is such a monumental deal for Oklahoma moving forward. 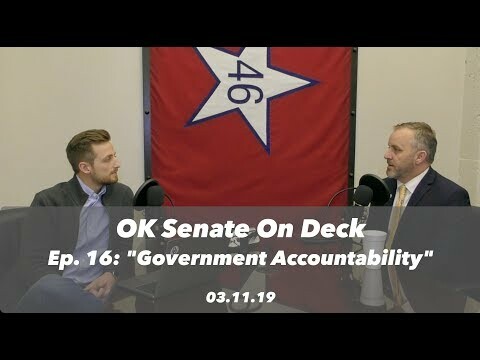 In this week's OK Senate On Deck episode, Pro Tem Greg Treat talks about legislation involving Government Accountability, Budget Transparency, continued Education Investments, and Criminal Justice Reform. Find out the key bills that he says will cause big advancements for our state! 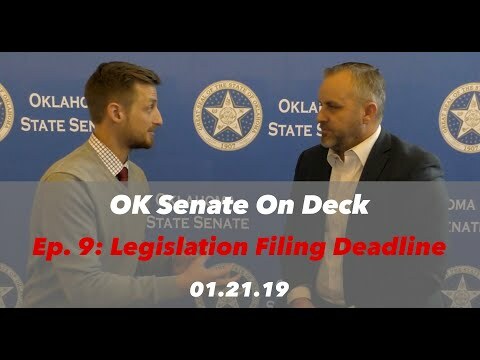 5-Day school weeks, Pro-Life Legislation, and Constitutional Carry — We cover it all this week in OK Senate On Deck with Pro Tem Senator Greg Treat! 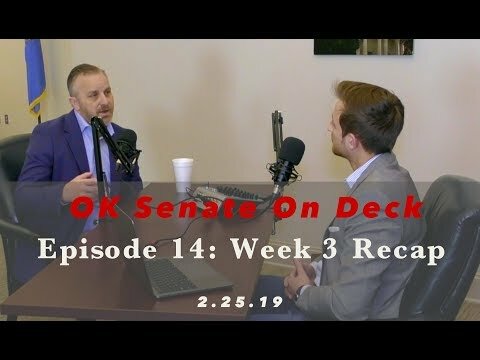 In this week’s OK Senate On Deck podcast with President Pro Tempore Senator Greg Treat, we discuss the events from last week and focus in on abortion legislation and the status of medical marijuana in our state. 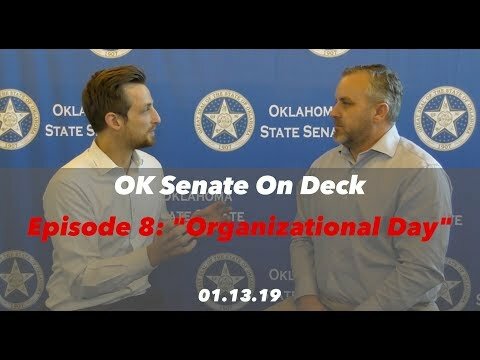 In this week’s OK Senate On Deck, Senator Treat talks about his thoughts one Rose Day, the Governor’s State of the State address, and looks ahead to what’s next for the OK Senate. Senator Greg Treat sits with us this week to further explain the OK Senate Republicans' Top 4 Agenda Points that will be focused on this Legislative Session. 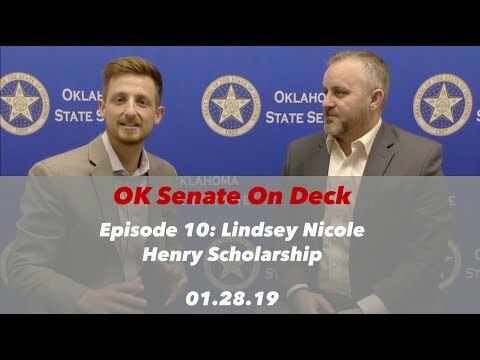 This week’s OK Senate On Deck episode focuses on a bill that can have massive impacts on the lives of students who are most in need. 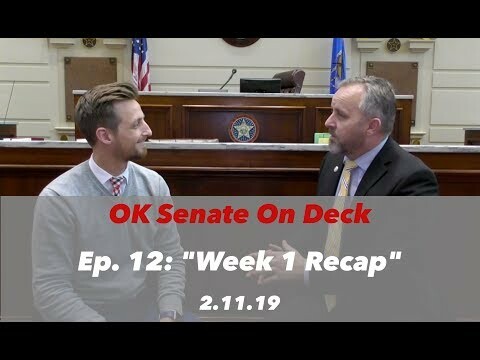 In this week's OK Senate On Deck video Pro Tem Greg Treat talks about all the legislation he has filed this year and also gives some insight on other bills he's excited about. The 57th Legislative Session is right around the corner! 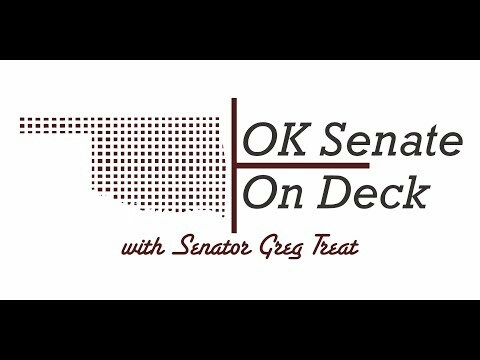 In this week's On Deck episode, State Senator Greg Treat talks about all the preparation being made right now in the Senate and also comments on the legislation that has been filed so far. 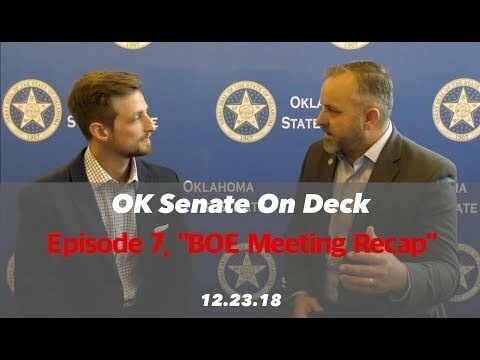 In this Christmas week episode of OK Senate On Deck episode, Senator Greg Treat explains why he's hesitantly optimistic about the potential $612 million surplus in new state funding for next year. 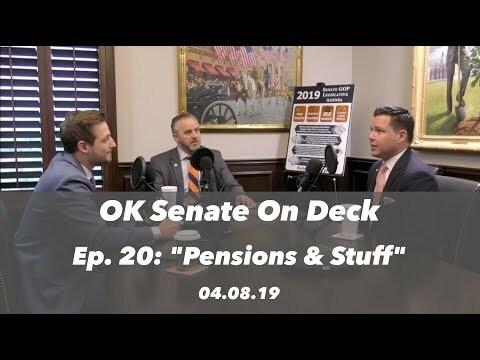 In this week's episode of OK Senate On Deck, Senator Treat reviews a few of the greatest Oklahoma accomplishments the Legislature has proposed just within the past few years. 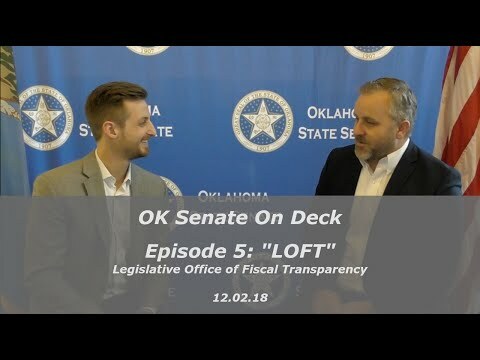 In this week's episode we talk about what Senator Treat's proposed bill, dubbed the "LOFT Bill", will do for the state of Oklahoma. This Legislative Watchdog is designed to increase Accountability and Efficiencies while reducing wasteful spending. 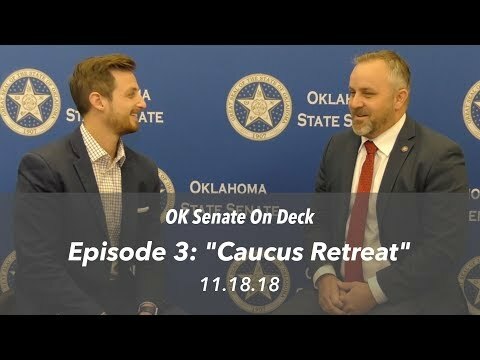 In this short episode of OK Senate On Deck, Senator Treat recaps the 2018 Republican Caucus Retreat and also gives us an inside look into his Thanksgiving family traditions! 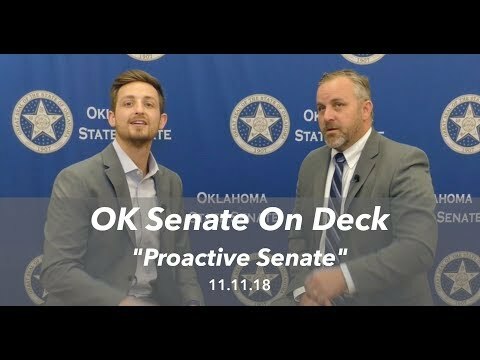 Senator Treat discusses implementing a Legislative Budget Office to increase government transparency & efficiencies in this episode of OK Senate On Deck. Special Edition with U.S. Senator James Lankford. We discuss 2018 election results and each of their visions for the state moving into 2019. Senator Treat talks about transparency, his role as Pro Tem designee, and his vision for Oklahoma moving forward. 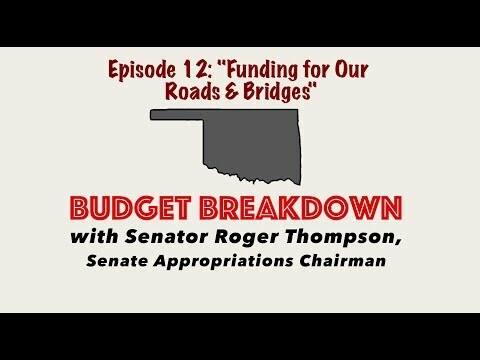 In this week's #BudgetBreakdown, Senator Roger Thompson walks us through all the main funding sources used for our roads and bridges and also gives a great update on the budgeting process! Check out this week's Budget Breakdown episode to see how Senate Appropriations Chairman Roger Thompson is working through the latest budget questions! In this week's Budget Breakdown with our Appropriations Chairman, Senator Roger Thompson, we discuss a common term that is used during the legislative process of a bill, "Title Off". Senator Thompson explains what this means and why it is so important to understand! In this quick Budget Breakdown episode, Appropriations Chairman Roger Thompson explains what a Supplemental request is and how the legislature works through these additional appropriation requests. Did you know most state agencies receive funding from several sources? Senator Thompson explains all these sources to us in this week's Budget Breakdown episode! How does Oklahoma utilize federal money to support our health care programs? On today's episode of Budget Breakdown, Senator Roger Thompson walks us through this process and highlights SB 605 "The Oklahoma Plan". A bill that increases Oklahoma health care programs. The total number for appropriations this year is $8.25B, making it $574.5M above last year's number. So what's going to happen with this year's surplus of funds? Appropriations Chairman, Roger Thompson will explain where the main expenses and focuses will be! Before the Legislature can appropriate funds to state agencies there are many expenses that must be met. Our State Bonds are in that category. Today we examine what these expenses look like for the state! This week Senator Roger Thompson is going to update us on where we are right now in the budgeting process and also explain how the Senate works with the Governor and the House of Representatives to come up with a final budget. This week on Budget Breakdown, Senator Roger Thompson explains how Federal expenses are accounted for in our #StateBudget. These health care expenses are included in the encumbrances that must be covered before appropriated funds can be distributed to state agencies. This week we're going to learn about Ad Valorem Tax Reimbursements. Senator Roger Thompson will be showing us how this fits into the big picture of our state budget! In this week's Legislative Update we take a look at three bills that include Education Funding, Government Innovation and Reforms. Government efficiencies, Criminal Justice Reform, and Oklahoma Health are all categories we examine this week! Check out the latest OK Senate Legislative Update to learn more on Senate legislation. Want to know what topics the Senate is focussing the majority of legislation on this year? Check out this week's Legislative Update article! In this week’s edition of OK Senate Legislative Update we focus on legislation being ran in the areas of fee eliminations, county land control, and increasing communication to victims of crimes. In this week's edition of OK Senate Legislative Update, we take a look at three bills that have been requested so far in the topics of Government Efficiencies, Education, and Veterans Affairs. This week's edition of OK Senate Legislative Update includes Interim Study recaps of a Bicameral study to increase care for traumatized children, a look into the innovation of Oklahoma Education, and furthering workforce development for OK students. In this week’s edition of Legislative Update, we look at the Senate’s look into Truck Platooning, Land Acquisitions, and more. Today we look at recent OK Senate interim studies. Covering topics from Government Transparency to School Bullying to Water Aquifers, the OK Senate GOP is covering a lot of ground moving into the 2019 session. In this week's episode we discuss his experiences so far as a new Senator, he gives us his thoughts on the need for more Budget Transparency (SB1 “LOFT"), and points out how we must restore trust in state government. 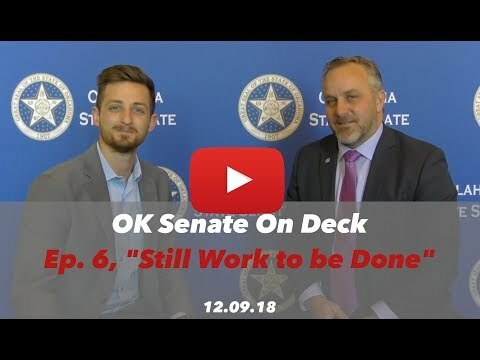 Senator Chris Kidd sits with us this week on OK Senate Sit Down to discuss to discuss some education legislation that he is running this year and also to get his thoughts on how this Legislative Session is going so far! 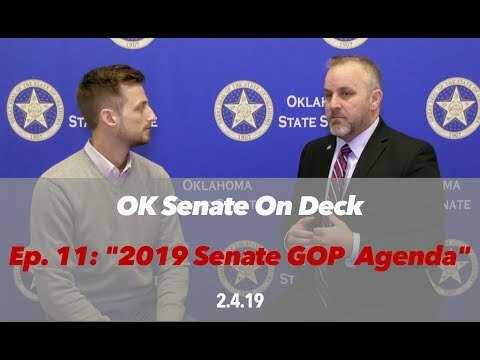 Senator Casey Murdock, chair of the Senate Agriculture and Wildlife Committee, sits with us this week on OK Senate Sit Down to tell us about his background and also walks us through a few of the bills he is running this year! 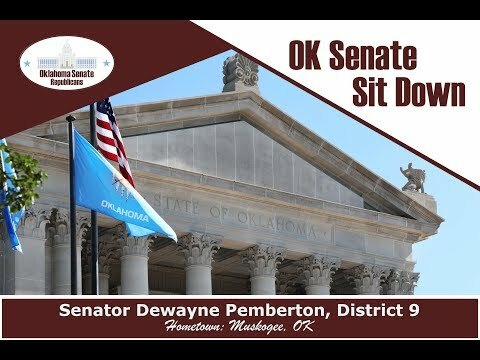 Senator Dewayne Pemberton sits with us this week to discuss Education investments and gives us a vision for what he hopes will be accomplished this year in his committee. Senator Brenda Stanley is our latest guest on OK Senate Sit Down! We learn about the expertise she has from her 43 years of education experiences and also talk about legislation she has planned for her first year as an Oklahoma Senator. In this week's OK Senate Sit Down, we sit with Senator Daniels to learn about her experiences so far in the Oklahoma Senate and what she expecting in her new role as Chair of the Senate Judiciary Committee. 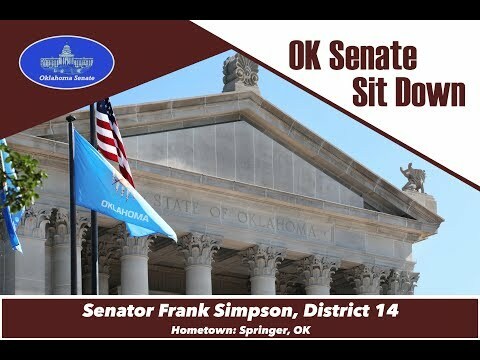 In this week's OK Senate Sit Down video, we sit with the chairman of the Senate Education Committee, Senator Gary Stanislawski, to discuss the status of teacher pay and the nation wide teacher shortage. Senator David Bullard is our guest this week in OK Senate Sit Down. 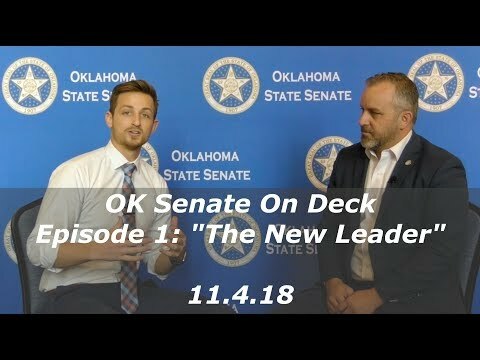 We learn a little about his background and expertise that he is bringing to the Senate and he also tells us about the #MyDurant movement that is happening in his hometown of Durant, OK. 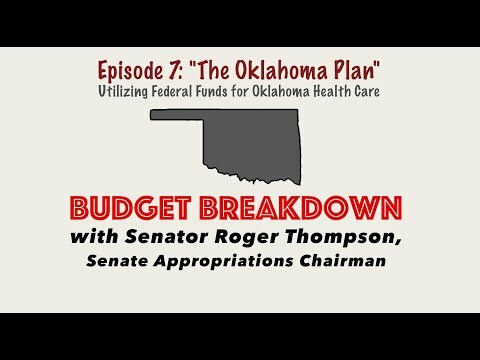 In this OK Senate Sit Down special edition, we speak with Senate Appropriations Chair Roger Thompson to learn more about the $612M surplus that is being projected for next fiscal year. In this week's edition of OK Senate Sit Down, we speak with Senator Adam Pugh about criminal justice reform and all the challenges his committee will be facing. 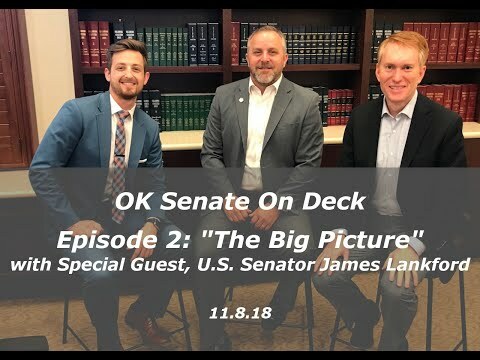 In this week's episode of OK Senate Sit Down we talk with Senator McCortney to discuss the latest updates on the implementation of Medical Marijuana in Oklahoma. In this episode of OK Senate Sit Down, we visit with the new Majority Floor Leader, Senator Kim David, to discuss the Oklahoma budget and the several leadership roles she has undertaken in the Oklahoma Senate! Aerospace is one of the fastest growing industries in Oklahoma! In this episode of OK Senate Sit Down, we talk with Senator Rosino to discuss all the recent advancements. In this week's episode of OK Senate Sit Down, we sit with Senator Stephanie Bice to discuss her work and contribution to the implementation of alcohol reform and more. Appropriations Chair, Sen. Roger Thompson talks about the OK State Budget moving into 2019 and his role as the newly appointed Appropriations Chair. Senate Tops 1,000 Bills for Upcoming Session with Government Reform and Education being the top focus. Newly elected Pro Tem, Senator Greg Treat, seeks nominees for agency, board, commission appointments. If you are interested or have more questions about serving, the Pro Tem’s Office has created an e-mail address to which you can send resumes or ask questions. Send emails to appointments@oksenate.gov. SB 1, dubbed the LOFT bill, is designed to increase efficiency and accountability within state agencies by providing the Legislature with more consistent and in-depth information. Pro Tem Treat announces the Chairs and Vice Chairs for the Senate Committees. Check out the entire lineup in this week’s Hot Topic Issue. Want to know a little more about the newest Oklahoma Senators? Check out this week’s Hot Topic article. Check out the firefighters retirement fund that has grown over the past 8 years due to republican reforms! Senate Republicans have made a concentrated effort to take care of our retired teachers and make sure their retirement system is correctly funded! Check out this week's #AgencyBudgetBreakdowngraphic to better understand the state of our common education funding and to get answers to commonly asked questions! A lot of questions being asked about SB 441, AKA: “The 5-Day School Week Bill”. Check out this graphic for answers of the most common questions. "Constitutional Carry Bill" has passed out of Committee. What does this bill actually do? Check out the graphic for answers to the most common questions! Bill filing deadline has passed and the Senate has proposed over 1,000 pieces of legislation. Check out the graphic to find out what topics have been most focused on! This week's Budget Breakdown highlights the Health Care Authority's annual budget. Did you know the Health Care Authority is the second highest appropriated agency in our state? Second only to the Department of Education. This #FridayGraphic is the first of our latest Infographic series called “Budget Breakdown. This week we focus on the Department of Education budget. Check out the graphic for more information. Legislation deadline is fast approaching. Here’s a quick look at what topics are being most focused on so far by OK Senators and their legislation. Did you know that 12 state agencies receive 92.72% of the state’s appropriated budget? Check out our #FridayGraphic to learn more about these top appropriated agencies! Oklahoma Fosters does amazing work supporting Oklahoma children who are in need of temporary or permanent families. Check out the graphics to see how you can help support #OKFosters. Did you know the OK Senate has a Charitable Campaign each year? Check out this week’s graphic to learn more!